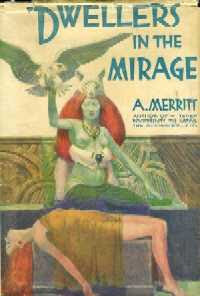 First serialized in 1932, Dwellers in the Mirage is a fantasy novel by Abraham Merritt. The novel tells the story of an explorer named Lief Langdon who discovers a lost valley in Alaska, whose inhabitants believe him to be the reincarnation of a long-lost hero, Dwayanu. There's a cult dedicated to a Cthulhu-like entity -- he's even octopoid -- that demands human sacrifice and not one but two beautiful women whose affections Langdon must choose between. It's a terrific, if uneven novel, and it's not hard to see why Gygax found it (among several other Merritt works) to be so enjoyable. I find it interesting to note that a great many of the books and stories Gygax acknowledged as influencing D&D were in fact "lost world" tales, in which a modern day hero stumbles upon some throwback to an earlier, more magical era. I'm not quite sure what this says, honestly, but some thoughts are percolating in the back of my brain nonetheless. Perhaps I'll make a post about it later. I don't think it says anything except about what was fashionable when those books were written -- in the 19th and early 20th centuries you could write books about unknown places on Earth (or set on Mars) and audiences could suspend their disbelief. In the post-WWII, and especially post-Space Age era, these "lost worlds" had to instead be other dimensions or far away solar systems, even if the content is otherwise pretty much the same. As for Dwellers in the Mirage it's a fantastic, really fun book, tied with The Ship of Ishtar as my favorite by Merritt. He style feels very old-fashioned to modern readers and is a bit jarring at first, but once you accept it his works are really amazing, ad nobody before or since has done it quite like him. It's a true shame more of his books aren't currently in-print (and I hope Erik Mona's mention in his introduction to Infernal Sorceress how Gary lobbied him to include Merritt in the "Planet Stories" line is a hint towards a future announcement :) ). N.B. A search on Dwayanu turns up an online text of the book. It's nice how many of the pulp classics are preserved and made accessible this way. Also, I suspect the point James is hinting at is that Gygax (and maybe other early RPGers) was engaging in a metaphorical journey similar to the fictional travels of those "lost worlds" characters. This the focus is on exploring the world; the character is mainly a vehicle for doing so and doesn't need much of an inner life let alone exploration of internal conflicts. I'm not very subtle, am I? Well spotted. I'm with Foster - there were even editorial requirements on writers of the period that to get into the sci-fi magazines you had to have some element of reality - so many of them claimed past history like RE Howard, or lost worlds. I should have known that, but I did not. Thanks for pointing that it. Very useful.